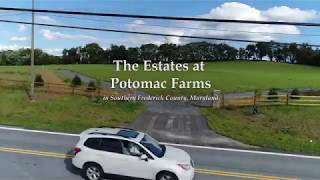 Lot 101 is 6.27 acres located in the Estates at Potomac Farms, an exclusive community featuring 11 custom home sites ranging in size from 2 to 12 acres. These rural residential estate lots are nestled on hilltops offering extraordinary 360-degree views of the Catoctin Mountains to the west and Sugarloaf Mountain to the east. Located just 4 miles beyond Buckeystown, 12 minutes from I-270 and a mile from the Chesapeake & Ohio Canal National Historical Park on the Potomac River. Disclosure: Earl M. Mackintosh, III (Seller) is the Broker of record of MacRo, Ltd, the Realtor representing the Seller. The community does NOT have a homeowners or community association. Portions of each driveway and the entrance features require lot owners of each section to share in maintenance.